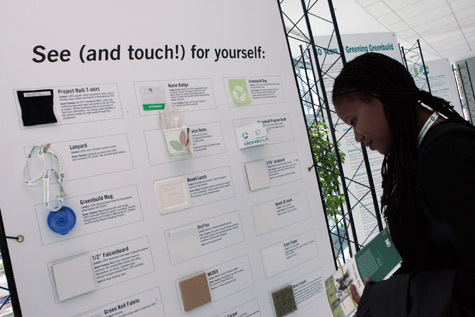 You can read more about Greenbuild’s 2011 sustainability story in the report. It’s a document that we hope will catapult green meetings into the mainstream, and we hope the unprecedented comprehensiveness of this report will allow it to serve as a guide for the meeting industry on its path to more sustainable practices. Most of our sustainability objectives focus on reducing the negative impact Greenbuild has on the host city and the planet; but when it comes to improving communities, we strive to harness Greenbuild’s energy to increase our positive impact and leave long-lasting legacies. In 2011, Greenbuild left a positive social impact on two communities—Toronto, our Greenbuild host city, as well as Port au Prince, Haiti. In Toronto, we worked with local organizations to support two projects that explore and celebrate the theme of teaching children about urban food. In Haiti, we sourced Greenbuild t-shirts and conference bags to support the local economy. Greenbuild attendees were also inspired to support USGBC’s Project Haiti Orphanage and Children’s Center through an auction to win a Gibson guitar signed by Maroon 5. This type of cross-sector commitment requires an impressive effort from the entire Greenbuild community. Each year our efforts are supported by the collaborative work of our exhibitors, vendors, hotels, venue partners, staff and student volunteers who we work with to incorporate sustainability into all aspects of the conference—though our advanced convention center waste diversion programs, the Greenbuild Mandatory Exhibitor Green Guidelines (GMEGG), hotel greening initiatives and more. We’re proud to have been awarded three IMEX Green Meeting Awards for our collective efforts, and incredibly thankful to our Greenbuild community, which is committed to putting on the most sustainable conference possible. 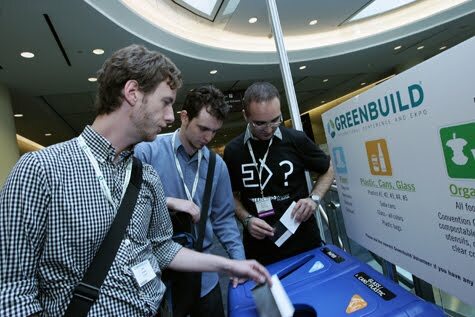 Greenbuild is our industry’s tent revival and the single place the green building community gathers to find inspiration, harness education, and conduct business year after year. Since its inauguration in 2002, Greenbuild has continued to be the premier conference convening the global leaders in sustainability and the built environment from over 122 countries. We’ve seen Greenbuild grow from just 4,000 attendees to over 23,000 last year, a growth rate of 475 percent. Opportunities remain for large events to reduce their environmental footprint while leaving positive social impacts, and USGBC and Greenbuild is committed to doing our part in paving the way. We hope you’ll join us at Greenbuild 2012, Nov. 14-16, as we write the next chapter in our conference greening story.